Direct mail marketing helps you find potential donors. Targeted mailing lists can help your nonprofit to find new donors that fit your organization’s ideal demographics. Mailing lists can target by location, gender, income, etc. Direct mail marketing keeps you in contact with your current donors. When you send out direct mail, you are reminding them of your organization and keeping it in the forefront of their mind. This also helps you to keep up-to-date database information on your donors, so you are aware if they have a change of address. You can let your donors know what your organization’s current needs are. Is there something specific your organization needs to purchase? Is there something that needs immediate financial attention? Let your donors know your needs in a visually and emotionally appealing way. Thank your donor for their last gift and tell them why their next gift will help your organization. Create multiple options for giving. Can they give online? Over the phone? Include this information on your mailing. Include the reminder that their donation is tax deductible. 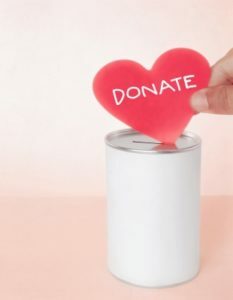 Drive an emotional connection by personal stories of how their donations benefit real people. Make sure to include the option of updating their mailing address, adding an email address, etc. Be sure your mailing is appealing to the eye, and don’t forget to always include your organization’s logo and information. Do you need help creating an effective direct mail fundraising piece? At Preferred Direct, our team of expert graphic designers can help. Click here for more information on our graphic design services. Preferred Direct can help you through the entire fundraising by mail process, from creating mailing lists, designing artwork, printing products, handling postage, packaging and shipping, Preferred Direct can do it all. Click here to learn about how Preferred Direct can help your nonprofit organization with direct mail fundraising or call us toll free at 1-844-719-1848. At Preferred Direct, we make sure to keep your cost down. You will have a project manager who keeps your print jobs on track. Our project managers stay on top of your print jobs and can answer any questions you have along the way. We even provide emergency print services for those fast approaching deadlines. We also provide tracking so you can be assured that your shipment is arriving in a timely manner. One of our printers is the Xerox Impika®, a top-of-the-line machine that prints quality materials fast, ultimately saving you time and money. When choosing a commercial printing company, you can count on Preferred Direct to be cost effective, speedy, and customer-friendly. Call us toll-free today at 1-844-719-1848 or click here for an online quote. Photos courtesy of FreeDigitalPhotos.net by winnond (donate) and stockimages (charity).